Back in 2014, the animated film The Nut Job was a somewhat of a surprise hit during the first month of the new year. Created by Open Road Films and ToonBox Entertainment and directed by Peter Lepeniotis, the film, which had the voices talents of Will Arnett, Brendan Fraser, Katherine Heigl, Maya Rudolph, Liam Nesson, Gabriel Iglesias, and several others, followed the misadventures of Surly, a self-serving exiled squirrel, as he finds himself helping his former park animal brethren raid a nut store to survive, that (unbeknownst to them) is also the front for a human gang’s bank robbery. As stated, the movie, which was released in January of 2014 as well as being released alongside other films like Jack Ryan: Shadow Recruit, Ride Along, and Devil’s Due, did surprisingly well. While most critics panned the film (ranging from mixed to negative), The Nut Job did gross over $120 million worldwide against its production budget of $42 million dollar. Thus, the film didn’t break any records or becoming the highest grossing movie that year, but it did make its money back and then some, which eventually gave the studio to greenlit a sequel feature. Now, three years after the first film was released, Open Road Films (as well as ToonBox Entertainment) and director Cal Brunker present the sequel to The Nut Job, with the movie The Nut Job 2: Nutty by Nature. Is this follow-up animated worthy seeing or is it just another boring and unnecessary second installment? With the local nut shop abandoned, squirrel Surly (Will Arnett) has created a paradise of free food, welcoming all the wild creatures from the park to enjoy a lifetime supply nut-based food. However, Andie (Katherine Heigl) disapproves of the arrangement, trying to lure her animal brethren back to the local park, stressing the importance of foraging for food, preserving the wild and animalistic way of thinking. When an accident destroys the nut shop, a blissful nut utopia is quickly replaced with a harsh reality, forcing Surly to swiftly find a new way to acquire new easy food source for him and the rest of the animals. Unfortunately, their home in the park is soon threatened by the human Mayor Percival J. Muldoon (Bobby Moynihan), who wants to turn the unprofitable nature park into an amusement park, demolishing the greenery, which inspires the furry residents to fight back, looking for help from a pack of rogue mice led by Mr. Feng (Jackie Chan). I remember back in 2014 seeing the trailer for The Nut Job and (like many out there) I wasn’t impressed by what I saw in the film’s preview. Also, with other movies coming out its initial week (I remember I went to go see Jack Ryan: Shadow Recruit that opening weekend). I did eventually see The Nut Job sometime later (via iTunes rental) to see the movie. Suffice to say, that I found the movie to be exactly what I thought of it; bland, derivate, and a little bit choppy. Also, what was up with that weird ending credits playing gangnam style with an animated Psy dancing around with some of the cartoon characters. WTF! So, like many out there, I was somewhat surprised that The Nut Job did make a decent amount of money at the box office and was even more surprised to learn that it was gonna get a sequel in the coming years. This brings me back to the present for The Nut Job 2: Nutty by Nature. Naturally, I heard the all the buzz about it being created (it took the studio three years for this sequel to fully materialize) and did see the film’s various trailers, which, much like the first movie, didn’t impress me. Thus, I went into the second movie with somewhat of low expectations. So, what did I think of it? Well, my low expectations were met and that’s not really a good thing as The Nut Job 2: Nutty by Nature just felt derivate and lackadaisical. Sure, a lot of characters from the first film were returning (along with their respective voice actors) and the animation is better, but this is one animated sequel that no one really asked for. Nut Job 2 (my abbreviation for The Nut Job 2: Nutty by Nature) is directed by Cal Brunker, whose previous works include being a storyboard artist for films like Minions, Ratchet & Clank, and Ice Age: Continental Drift as well as directing the 2013 animated film Escape from Planet Earth. Brunker has a somewhat difficult job in trying to craft a story that expands upon the characters from the first film to make for an entertaining feature. Unfortunately, Brunker only half succeeds on the promise, but I’ll get to that below. Perhaps one of the greatest strength that the film has going for it is in its animation. While the first movie’s animation looked dated (in comparison to the other cartoon films that year), Nut Job 2’s animation has been greatly enhanced. Colors are more vibrant, details are more intricate, backgrounds are lush, and overall character movement seems more fluid. Yes, it won’t be out a Disney / Pixar or DreamWorks film (in terms of style and animation), but animation in Nut Job 2 is a vast improvement than its predecessor. Also, in terms of filmmaking, the movie is your standard animation romp that one would expect from a kid’s flick. So, all other aspects from film editing (Paul Hunter), to the art direction (Andrew Woodhouse), to the film’s score (Heitor Pereira) are even-keel / average. I’m not saying they’re good or bad…. it’s on the industry standard (aka average). Unfortunately, Nut Job 2 doesn’t fare that well, with numerous problems along the way. Perhaps the biggest culprit of the feature is the film itself. As stated above, the first film wasn’t that great and was somewhat of a surprised that it did mildly well at the box office (even more that it was granted a sequel movie). So, it comes as no surprise that Nut Job 2 is (as a whole) completely unnecessary as it’s a continuation film that no one really desired and / or cried out for. Moving beyond that pre-conceived notion, the movie itself is just as generic, derivate, and devoid of anything creatively fun. With so many recent animated hits like The LEGO Batman Movie, Cars 3, and Despicable Me 3, Nut Job 2 just falls below the kid animated standard, failing to deliver an impressive tale. Yes, it has all the fanfare one would expect from a kid-friendly cartoon movie (colorful animation, energetic characters, cartoon-ish bad guys and henchmen, etc. ), but it just seems weak in almost every area; subpar to what’s already been released recently in animated features. The story has been told before, the bad guy’s villainy is generic, subplot / side-stories are recycled, the characters have little to no growth, and the comedy aspect of the movie feels stale (relying mostly on repetitive jokes and maniac chase gags). Also, it doesn’t help that the film’s script, which was written by Brunker and Bob Barlen, seems lackadaisical with very little original / creative concepts within the working dialogue and / or storytelling elements. Additionally, despite the film having a runtime of only 91-minutes long (the somewhat standard runtime for a kid’s animated feature), Nut Job 2 seems like it goes on forever. This, of course, comes from the movie’s narrative, which is somewhat thin, and just plays out in a very predictable manner (i.e. very little meaty on the bone). In truth, I thought the movie was going to end at one point, but then it continued for another half hour. While the movie suffers greatly from just being generic and formulaic, Nut Job 2 voice talents do help elevate the film (as a whole), but that’s only slightly. With the film being a sequel, many of the characters from the first film return as well as their corresponding voice actors to bring their voices to life. Leading the charge of the roster is Will Arnett and Katherine Heigl as the two lead squirrels Surly and Andie. Arnett, known for his roles in Arrested Development, The LEGO Batman Movie, and Up All Night, easily slides back into his character of the incorrigible and easy-going Surly, while Heigl, known for her roles in Grey’s Anatomy, Knocked Up, and The Ugly Truth, returns as the calm and more level-headed Angie (a sort yin to Surly’s yang). While the character arcs aren’t really compelling and don’t evolve from what’s already presented in the first film, both the voicework of Arnett and Heigl are good. 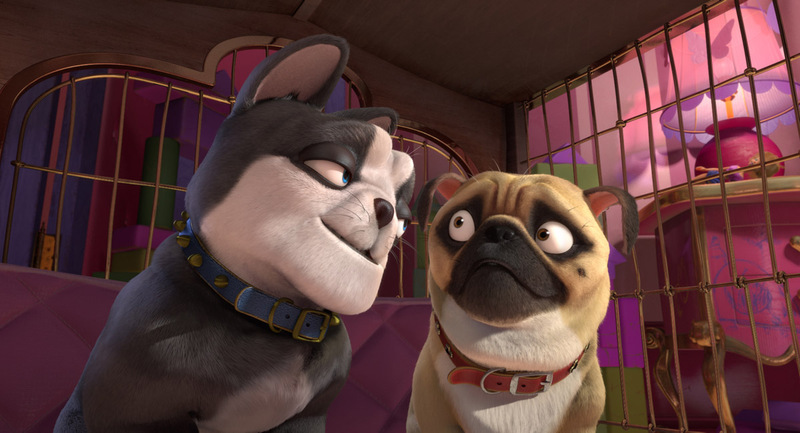 The rest of the returning Nut Job characters return for this second installment, including Maya Rudolph (Sisters and Bridesmaid) as the Pug dog Precious, Jeff Dunham (The Jeff Dunham Show) as Mole, and Gabriel Iglesias (Magic Mike and The Fluffy Movie), Sebastian Maniscalco (Wild West Comedy Show), and Kari Wahlgren (Fairly OddParents and Niko and the Sword of Light) as the groundhog trio of Jimmy, Johnny, and Jamie. Side-note: Annick Obonsawin and Joe Pingue voiced Jamie and Johnny in the first Nut Job film. Of course, the big named actor that’s been toted with Nut Job 2 is Kung-Fu / actor Jackie Chan as the territorial leader of a street mouse gang, Mr. Feng. Chan, known for his roles in Rush Hour, Police Story, and The Forbidden Kingdom, seems to be having fun as Mr. Feng, a character who know his Kung-Fu and doesn’t like to be called “cute”, but the character itself is just really unnecessary and not really vital to the main plot of the feature. Thus, Chan’s Mr. Feng, while a fun addition, falls short. The rest of the supporting cast are new characters with their respective voice actors being well-known / recognizable from their previous works. This includes Peter Stormare (Armageddon and 22 Jump Street) as the deranged animal control officer Gunther, Bobby Moynihan (Saturday Night Live and Sisters) as the film’s greedy antagonist Mayor Percival J. Muldoon, Isabela Moner (Transformers: The Last Knight and Splitting Adam) as Muldoon’s spoiled brat child Heather, and Bobby Cannavale (Boardwalk Empire and Blue Jasmine) as Heather’s French bulldog Frankie (who falls in love with the character of Precious). Again, the actors and actresses behind these characters are good, but the character themselves are, more or less, either one-note and / or stock-like supporting characters. 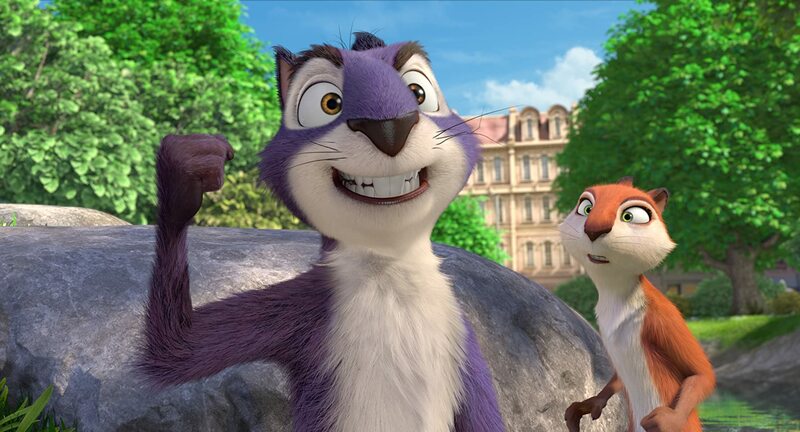 Surly, Andie, and the rest of their animal gang rally together to defend their park (their home) in the animated movie sequel The Nut Job 2: Nutty by Nature. Director Cal Brunker’s newest film further continues the mischievous adventures of Surly and friends, meeting up with new characters, tackling a bigger issue / plot, and overall better animation-style. Unfortunately, those positives (as well as the solid voice acting talents) can’t outweigh the film’s overall negatives, including an unoriginal story, predictable formula, passible humor, generic characters (and their development), and just being an overall sequel that nobody really wanted / desired. Personally, this was just a very mediocre endeavor. Yes, it proved to be slightly better than the first one, but the first one wasn’t anything spectacular to beginning with. Thus, I definitely say its skip it as there’s little reason watch this cartoon sequel, let alone watch the first one. While a lot of animated studio will continue to make spin-offs and sequel films (for mostly all the right reasons), The Nut Job 2: Nutty by Nature doesn’t fall into that category and is just simply an unnecessary sequel from start to finish. Plain and simple.